A progressive local bonsai society, promoting bonsai in the North West and beyond. They hold monthly meetings and bi-monthly workshops. 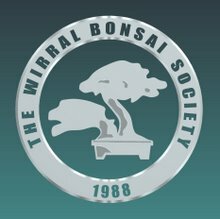 The Wirral Bonsai Society was formed in 1988 by a few local bonsai enthusiasts and has grown from strength to strength. Monthly Club meetings are held at the R.A.F.A. Club, 17 Shrewsbury Road, Oxton, CH43 1UU on the second Wednesday of the month. In addition, there is a bonsai workshop, the last Sunday of the month at Gordale Garden Centre and the second Sunday of the month at Port Sunlight, both run from 10.30 until 4pm. There will be experts on hand at both these venues, to give advice and assistance. There are 819 published entries in the Bonsai A to Z and the pages have been viewed 3061123 times. You can view all of the items in our Glossary of Bonsai Terms. Help us to increase the number of relevant bonsai terms included in this A to Z of Bonsai Terms. We include manufacturers and dealers in the dictionary, if you are one or know of one not mentioned then just click the link above and add an entry. If you have a favourite bonsai tree not mentioned just add an entry. We are trying to create a unique single free source for all bonsai terms and hope to capture worldwide bonsai terms for bonsai trees, bonsai clubs associations and national collections and the A to Z is free marketing for bonsai businesses and bonsai clubs.